Joel R. Beeke presents a heartfelt plea for the renewal of family worship in Christian homes. 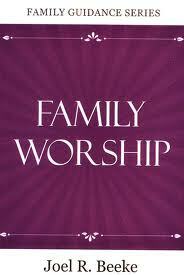 The family is modeled after the very being of God, providing a divine foundation for family worship from creation. This is not a mere idealistic suggestion for the godly family, but is presented in Scripture as a solemn duty. With great pastoral care, the author gives valuable insights into implementing family worship, answers common objections raised against it, and motivates the reader to follow through with it faithfully. Written by Joel Beeke. You can find the PDF here. 🙁 The link is not working for me? One of the benefits of switching to a Microsoft-based software suite is that you can use free Microsoft conversion tools to upgrade files and projects created with other programs to the format for your new program. These conversion tools are all available on the Microsoft website, and are designed to make the transitioning to your new software suite a simple one. Thanks.